Hello everyone! 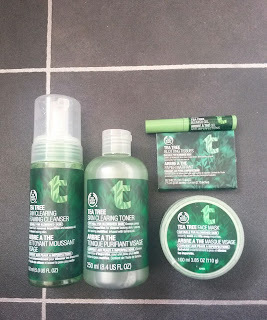 As somebody who has been using The Body Shop Tea Tree range religiously for the past, I don't know, 3 years, I thought I would share with you my product knowledge on them. Just to give you an idea, I have quite sensitive, blemished, acne-prone skin with discolouration and scars from past acne. All of The Body Shop's tea tree products will say for blemished skin on them. 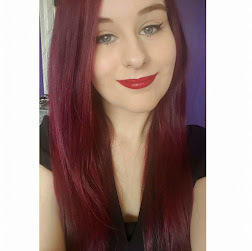 Here I will talk about every product I have tried from the range, which is most of them, as well as naming the rest of the range and their prices. What is Tea Tree Good For? Tea tree in itself is natural and antibacterial, making it perfect for getting rid of acne and preventing acne. You'll find a lot of skincare products aimed at clearing skin has tea tree in it. The Body Shop also use tamanu oil extract in their tea tree products which encourages skin to generate new tissue. This means it would be good for those who have scars and discolouration left from acne on their skin. 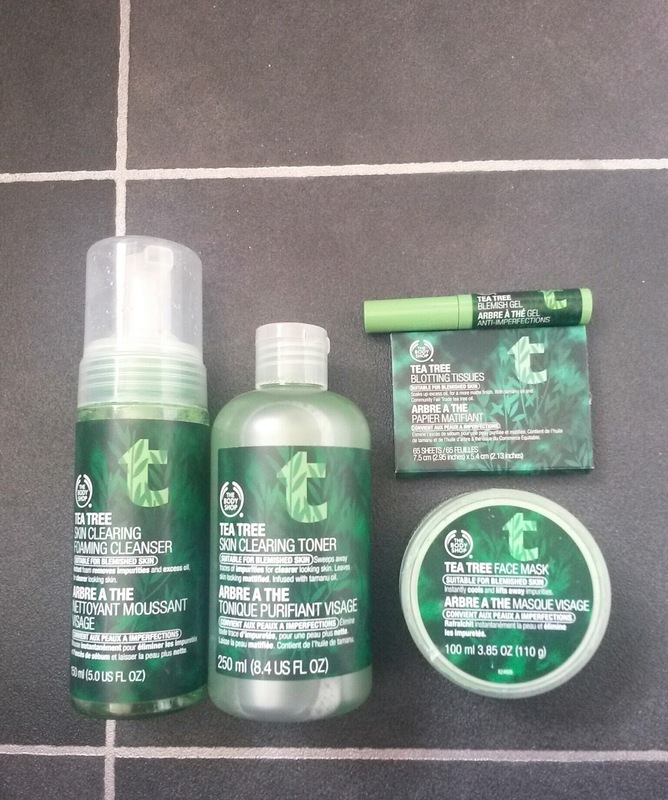 This therefore means The Body Shop Tea Tree range is good because not only does it treat and prevent acne, but it also helps treat the after mess of what battling with acne and leave behind. Tea Tree Skin Clearing Foaming Cleanser: (£5.50) I have used 3 bottles of this stuff so far and I like it. It can sometimes leave my skin feeling a bit dry but I don't mind that overall because I tend to use moisturiser after this step anyway. 2. Tea Tree Skin Clearing Toner: (£5.50) Wipe this over your face with a cotton pad and it will leave your skin feeling refreshed and looking matte. I like to use this at night time to take off any dirt left over on my face or any left over make up after cleansing. 3. Tea Tree Blemish Gel: (£6.50) This is for direct application, perfect for when you have a horrible spot that you need to directly go to war with. It a gel that goes straight on to the spot and works its magic. I find this a bit pricey for the fact it doesn't ever seem to last that long for me but it does its job nevertheless. 4. Tea Tree Face Mask: (£11.00) This is quite a large pot that trust me, will last you for AGES. I find this useful if I am having a breakout. Leave it on for 15-20 minutes then rinse off. Plus, it is also funny to take pictures with it on as the mask is bright green. 5. Tea Tree Blotting Tissues: I think this product may have discontinued as I can't seem to find it on The Body Shop website. Blotting papers are good for when you are out and about with make up on but have a bit of oil come through your foundation. You just blot these papers gently over your face and it picks up the oil, leaving you matte again. I don't know whether the tea tree does much but nevertheless they do the job they're designed for. 6. Tea Tree Squeaky-Clean Scrub: (£7.00) This isn't one of the products featured in the photo as I don't have this in my collection right now, however I have used it. This is a great exfoilating facial scrub which I liked to use in the shower. Exfoilating is great when you have acne scars as getting rid of dead skin cells helps encourage your skin to generate new skin cells. I like this and it feels refreshing in a hot shower. 7. Tea Tree Night Lotion: (£10.00) This isn't one of the products featured in the photo as I don't have this in my collection right now, however I have used it. It claims to replenish moisture overnight. I can't remember much about this, just that I always used to put it on before bed and it had that refreshing feel to it. 8. Tea Tree Face Wash: (£5.50) This is my holy grail from this range. I have no idea how many times I have used it but I would say at least 8 times. Again, this isn't featured in the photo as I don't have it in my collection right now. I had got given lots of the foaming cleanser for my Christmas so I don't need to repurchase this just yet. I think I will always use this and I swear by it. 9. Tea Tree Skin Clearing Lotion: (£9.00) This is not featured in the photo as it isn't in my collection right now. However, I have used it. This is to use after your cleansing routine to help clear up problem areas. Personally, I found this product annoying as for some unknown reason it wouldn't soak into my skin and instead build up in to rolls of product on my skin that I'd then have to pull off. Gross. Despite that, this is named as one of the Bestsellers on The Body Shop website so I suppose it must be worth giving a go. 12. Tea Tree Oil: (£6.00) Named as one of the 'Beauty Gems' on the website. 15. Tea Tree Body Wash: (6.50) I imagine this would be good for people who suffer with acne on their body, such as their back or chest. I spent a long time trying product after product to help me with my years and years long battle with acne and acne scars. Now I can finally say I have found the right products for me. If you suffer with acne, I really recommend this range. However, please note that using too much tea tree can dry out your skin and may even have an opposite effect. At one point I found my skin getting bad again and I couldn't work out why when I stuck to such a strict skincare routine. I soon found out that I was using too may tea tree products at once which was stripping my skin of the good stuff and making my skin irritated and break out. I recommend only using about 2-3 tea tree products at a time. For me, I ALWAYS use a tea tree face wash then pair it with one other tea tree product at a time. I hope you guys find this guide to The Body Shop Tea Tree range helpful! If you have any questions, please feel free to ask. Do you use any of these products? Let me know! I love this line! I use the face wash and a thick moisturizer by CeraVe to balance out the dryness. The toner is really great too, I love using it on breakouts. I honestly wouldn't recommend the tea tree oil from The Body Shop because it is super diluted!! You're better to get it from one of those essential oils shops because then at least you know it's 100%. Thanks for the comment! I always use the face wash it is my favourite from the line.